This article contains click symbols from the Khoekhoe language. Without proper rendering support, you may see question marks, boxes, or other symbols. Nǃxau ǂToma (short: Nǃxau, alternative spelling Gcao Tekene Çoma; 16 December 1944 – 1 July 2003) was a Namibian bush farmer and actor who was made famous by his roles in the 1980 movie The Gods Must Be Crazy and its sequels, in which he played the Kalahari Bushman Xixo. The Namibian called him "Namibia's most famous actor". Nǃxau was a member of the San, also known as Bushmen. He spoke Juǀʼhoan, Otjiherero and Tswana fluently, as well as some Afrikaans. He did not know his own exact age, and before his appearance in the films he had little experience of typical "modern" living: he had only ever seen three white people before being cast and was unaware of the value of paper money, allowing[clarification needed] his first earnings for The Gods Must Be Crazy ($300) to literally blow away in the wind. He came from a culture that did not value the material things that money could buy and consequently had never before learned money management skills; "he did not have the skills to manage his income," although he used some of it to build a brick house with running water and electricity for his family. In addition to The Gods Must Be Crazy, N!xau starred in a series of sequels: The Gods Must Be Crazy II, Crazy Safari, Crazy Hong Kong and The Gods Must Be Funny in China. After his film career ended, he returned to Namibia, where he farmed maize, pumpkins and beans and kept several head of cattle (but no more than 20 at a time because, according to The Independent, without the complex farming systems of the "modern world", he had trouble keeping track of more). The Namibian local daily New Era stated that he simply could not count further than 20. N!xau converted to Christianity. In July 2000, he was baptized as a Seventh-day Adventist. On 5 July 2003, he died from multiple-drug-resistant tuberculosis while he was out on an excursion for hunting guinea fowl. According to official estimates he was about 58 or 59 years old at the time. 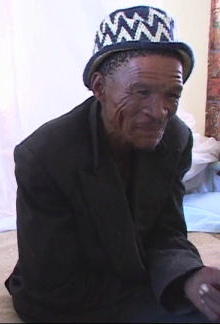 He was buried on 12 July in a semi-traditional ceremony at Tsumkwe, next to the grave of his second wife. He had six surviving children. ^ The letter in his name that looks like an exclamation mark is an alveolar consonant in his native tongue, Juǀʼhoan. The spelling of his full name Gcao Coma suggests that it is a voiced dental click. ^ a b Shiremo, Shampapi (30 September 2011). "Gcao Tekene Coma: Internationally acclaimed Namibian film star (±1944–2003)". New Era. Archived from the original on 15 May 2012. ^ a b c d e f Tangeni, Amupadhi (11 July 2003). "Cgao Coma – bridging ancient and modern". The Namibian. Archived from the original on 31 July 2003. Retrieved 19 January 2009. This page was last edited on 28 February 2019, at 01:43 (UTC).